WASHINGTON, D.C., March 20, 2018 — Astronomers have observed that galaxies rotate with such great speed they should be torn apart, yet they are not. It is as if some hidden mass is holding the galaxies together by exerting a gravitational force on ordinary matter. This unknown mass is known as dark matter. Ordinary matter makes up only 5 percent of all content in the universe, whereas dark matter constitutes more than 25 percent of everything. The remaining 70 percent is known as dark energy, but no one has ever directly observed dark matter or dark energy. In this week's issue of Journal of Applied Physics, by AIP Publishing, investigators report the discovery of a new material that may be able to directly detect dark matter. The material, known as a scintillator, should be sensitive to dark matter that is lighter than a proton. This will allow the search for dark matter to enter a largely unexplored mass range, below that of the proton. Dark matter particles heavier than protons are known as weakly interacting massive particles, or WIMPs. Researchers have tried to detect these in several ways, including in underground laboratories where a large amount of shielding can be used, but, so far, they have all failed. To date, nothing is actually known about dark matter's mass, and its detection would have huge implications for our understanding of the universe. The scintillator material reported in this work operates near absolute zero, or nearly minus 460 degrees Fahrenheit. It detects electrons recoiling from collisions with dark matter particles and consists of a target of ordinary matter, in this case gallium arsenide, or GaAs, doped by a small amount of other elements. The target emits a photon (a particle of light) after an electron in the target is excited to a high energy state through a collision with a dark matter particle. 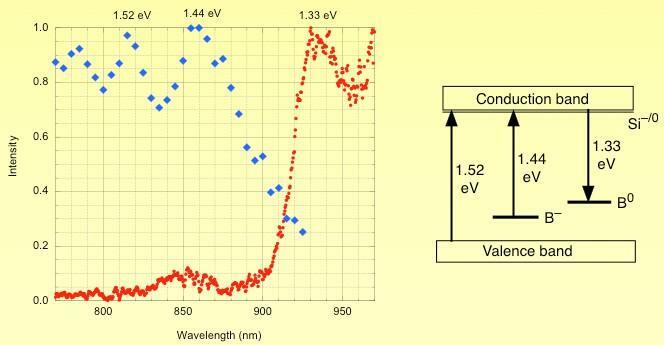 The discovery represents the first time that n-type GaAs, chosen for its low band gap energy, has been used as a cryogenic scintillation detector. When the new scintillation detector is combined with a cryogenic photodetector — which can detect light at very low temperatures — the result will be, in the words of Stephen Derenzo, lead author on this week's report, "a workhorse useful in the search for dark matter in a largely unexplored mass range." When the final device is constructed, experiments will be carried out deep underground to shield the detector from cosmic rays and other potential sources of false signals. One serious limitation of most scintillators is afterglow, also known as phosphorescence. Afterglow is a potential problem since it can mimic a dark matter detection and lead to a false signal. Data in this week's report show that no afterglow occurs with the new scintillator material — a very promising result in the ongoing search for dark matter. The article, "Cryogenic scintillation properties of n-type GaAs for the direct detection of MeV/c2 dark matter," is authored by S. Derenzo, E. Bourret, S. Hanrahan and G. Bizarri. The article will appear in the Journal of Applied Physics March 20, 2018 (DOI: 10.1063/1.5018343). After that date, it can be accessed at http://aip.scitation.org/doi/full/10.1063/1.5018343.